I have been interviewed for the ‘At home with…’ feature of Housing magazine, a monthly publication for housing professionals. 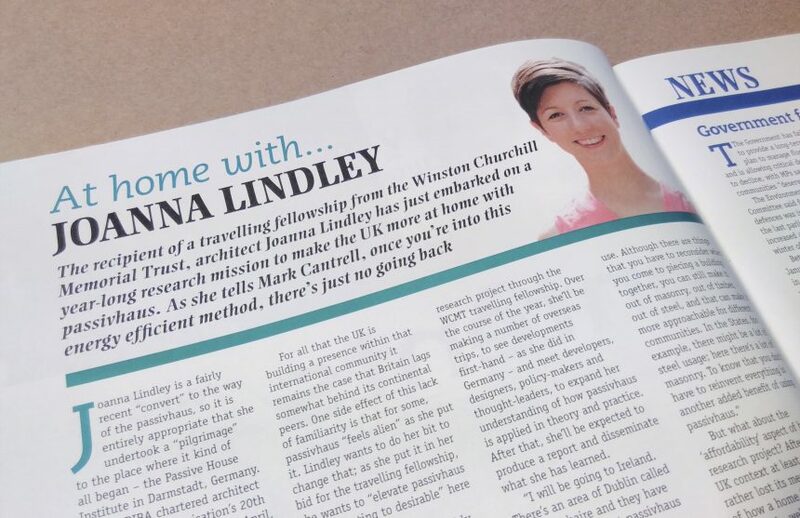 The article, written by Mark Cantrell, delves into the mission and methods behind my research Fellowship with the Winston Churchill Memorial Trust. I have been awarded a 2016 Winston Churchill Travelling Fellowship to learn from international examples howPassivhaus, the rigorous design and construction standard, can be elevated from daunting to desirable here in the UK. The Winston Churchill Memorial Trust (WCMT) is an organisation that funds “British citizens to investigate inspiring practice in other countries, and return with innovative ideas for the benefit of people across the UK”. I have been awarded a Fellowship within the category New Approaches to Affordable Housing – it is my aim to make Passivhaus the standard of choice for affordable housing.